A warm, moist breeze flipped and fluttered lifeless tail feathers. The wary gobbler’s body eased down to the oak leaves. The woodsman’s right hand massaged the left shoulder where the big tom’s spurs jabbed and poked. Despite the relief, the hired hunter for the local trader felt good about the pulsing pain, a reminder of the morning’s success. In the early years of my traditional black powder hunting, a simple pursuit ended with a puff of joyous white stench. Sometimes the “Kla-whoosh-BOOM!” resulted in game for the table, and sometimes it didn’t. But nonetheless, the history-based hunt ended. As I read, studied and paid attention to the glorious chases written about by the individuals who would one day become my hunter heroes, I realized that their hunts did not end with a dissipating cloud of smoke, but continued on. Just as I would place game in the back of the pickup and drive home, they did the same—walking, paddling a canoe or riding on horseback back to a wilderness camp. As I pondered and weighed this revelation, it became apparent that taking a turkey back to a pickup constituted a living history transgression and an unnecessary crossing of time’s threshold. The whole point of sewing clothes, making period-correct accoutrements and attempting to master the mysterious foibles of a Northwest trade gun was to travel back to yesteryear for the sole purpose of experiencing the texture of these people’s lives. I was, after all, working against myself and my lofty, but unattainable goals, because no portrayal, no matter how authentic, can turn back time. At best, a weary adventurer can only approach that possibility. 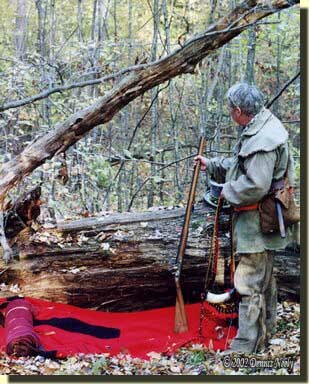 The first “hunting camp” was a red, four-point wool trade blanket spread beside a fallen, hollow, red oak trunk. That camp was on a small rise. A long pile of reddish-brown rotted wood is all that remains. But when I awoke from the first slumber, a feeling of security and safety surrounded that tiny corner of the forest. The log was at my back, and out front I had a magnificent view of the hardwoods. Any soul with hostile intent approaching that camp would have been easy to spot. Next, a handful of saplings formed rafters against a tangle of logs. A canoe tarp, spread out over the rafters and tied at the four corners, created a humble abode, a focus point for the exploits of the hired post hunter in the fall of 1795. This was the first backcountry hunting camp my alter ego returned to after the Northwest gun spoke. Like most traditional black powder hunters, family, work, and/or business responsibilities garnered most of my waking hours. A weekend scout to a location of historical significance was out of the question. Even trips to the North-Forty were limited in time and scope. And when hunting season rolled around, the concentration of effort centered on acquiring wild game for the freezer in a tradition manner. But other than the necessary time to construct a shelter, the inclusion of a hunting camp within the context of a time-traveling jaunt evolved into a continuation of the chase—a “trip home” that took minutes in most cases. Further, I discovered that a lean-to, brush shelter or a spread blanket provided a laboratory environment for wilderness classroom exercises. Like all of traditional black powder hunting, my studies could progress at my own pace and as time allowed, either in camp or in the glade. After that first camp experience, I revisited some of my favorite 18th-century hunting tales, paying particular attention to the shelters and camps described therein. As I read and researched, I started to see a pattern of use and a reference to the number of days spent in each camp. In that era, the early 1990s, I found three types of hunting camps and described them more by my own verbiage than that of my hunter heroes. First, the “lay-over camp,” what I now call the “night-fall camp,” was a shelter of convenience, often a blanket spread on the ground in a safe location, intended for a one time use. Second, the “extended base camp,” what I now call the “hunting camp,” was a structure constructed for habitation over a longer period of time—days, weeks or months. And third, the semi-permanent camp, or what is now referred to as the “wintering camp,” was built to withstand more than one season of use, a structure that could be returned to, refurbished and used again and again with minimal effort. A look at the primary documentation for each style camp will give a better idea of these three categories available to the traditional woodsman. Thus, a brief discussion of each shelter-type is provided on the following pages. And please remember, this is not a “be all and end all” categorization, but rather the scribblings and impressions of one weary 18th-century time traveler. Consider adding a period-correct shelter to your adventures, be safe and may God bless you.